So, a life-changing story that happened to me was that I moved to Texas. Actually it was that I moved to the United States, but to Texas from having spent about five years abroad growing up in my teenage years. 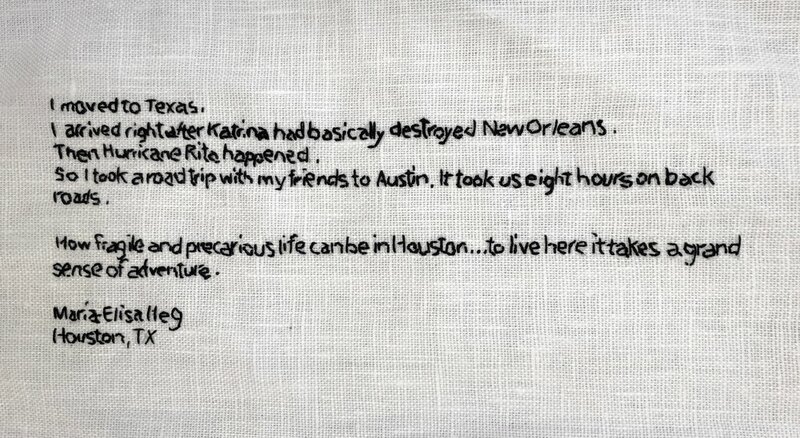 I arrived right after Katrina had basically destroyed New Orleans and within my first month of being in Houston the Hurricane Rita evacuation happened and I was very taken aback. I didn't know what to do - it was my first hurricane. And so I ended up taking a road trip with my friends to Austin and it took us eight hours on back roads, and back then you know, that was not much time - my friend had a GPS - but the thing about it was that it's both cemented my understanding of how fragile and precarious life could be in Houston, but also cemented a grand sense of adventure that came from living in a place that had that kind of a quality. As time has gone on I realized how tragic the evacuation was but a lot of my memory of that experience was positive. So it's an interesting struggle to remember those times that are very difficult but also are imbued with the sense of adventure, and subsequent storms and experiences have been different, but it really set a tone for me that Houston wasn't just a place that you could exist in. It was a place that you might have to survive and how is it going to affect you? And what was it going to mean to you as you move forward in life? So I've been here now since 2005 and I've learned a lot but that was a big important moment for my understanding of what it meant to be in Houston. My name is María-Elisa and I am willing to be named by name if you wish to share my story.